Thank you McCormick® for sponsoring this Brazilian Steak Kabobs post. All opinions are my own. These easy Baked or Grilled Brazilian Steak Kabobs with potatoes, bell peppers and onions are so crazy juicy and exploding with flavor in every mouthwatering bite! Quite possibly the most delectable steak kabobs you will ever eat! I can still remember the first time I dined at an all you can eat Brazilian Steakhouse, or more appropriately named, a Rodízio. Pure magic. My eyes were wide and my stomach was giddy at the not only a gourmet salad bar, a hot everything-you can-imagine-bar and decadent dessert bar, but all throughout the night, servers come to your table with diverse towering skewers stuffed with every meat imaginable from filet mignon, sirloin, lamb leg, sausage, chicken legs and sometimes exotic meats. The server slices meat directly off the cooking spit so you get to sample as many juicy, hot of the grill meats as your hungry heart desires. I wanted to create a melt-in-your-mouth tender, juicy steak kabob infused with the same magical vibrant flavors as a Rodízio. 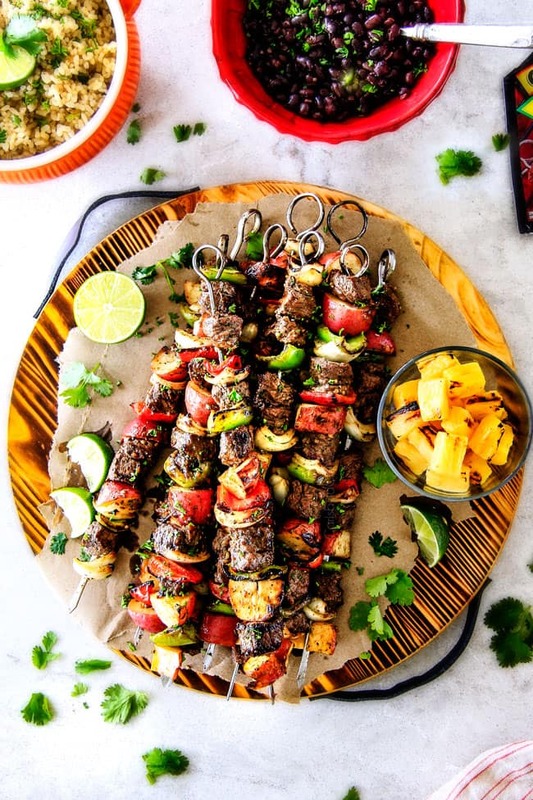 A steak kabob that will transport you to the melting pot of Brazil with its dynamic layers of flavor influenced by Europeans, Africans and native Brazilians. Enter these Brazilian Steak Kabobs. Mission accomplished. And what better occasion to indulge in tasty, tangy and totally delicious steak kabobs than the 4th of July? 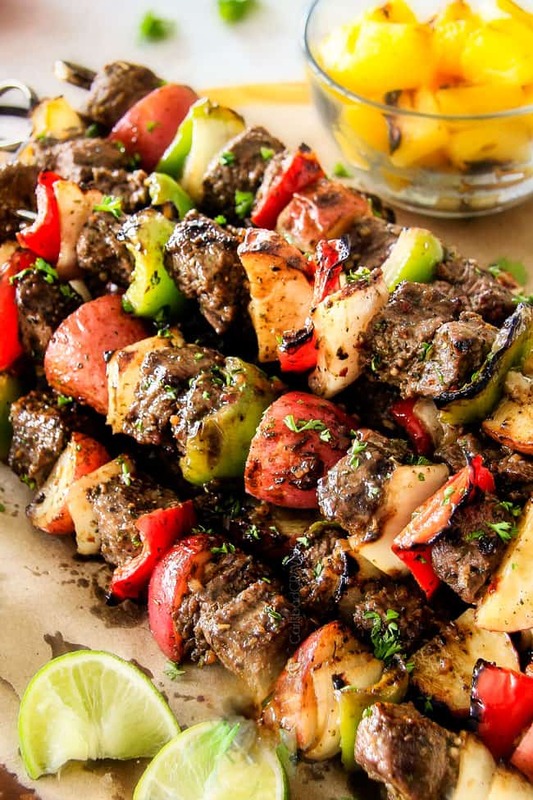 These Brazilian Steak Kabobs with Potatoes and Peppers are simply jaw droppingly delicious. An epic explosion of flavor. Or “insane,” as Patrick calls them (which you might have learned by now is reserved for only the most delectable morsels earning his highest praises). 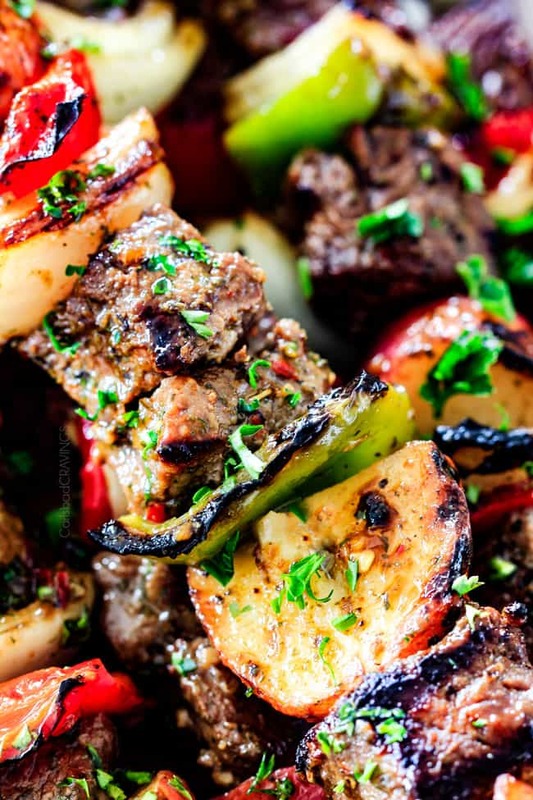 What I especially love about these Brazilian Steak Kabobs is that although Brazilian flavored, they are not traditional Rodízio style all meat, but instead boast steak, potatoes, bell peppers and onions for a complete meal-in-one. 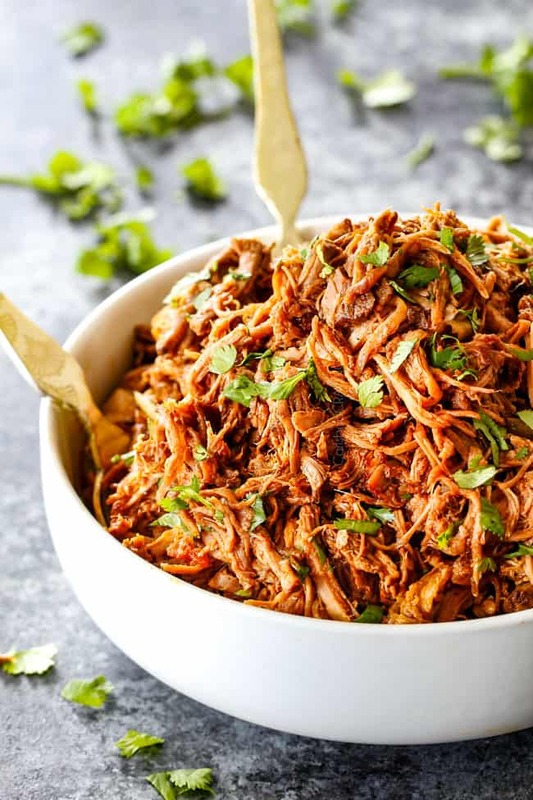 You can serve them with some Mexican Rice or Cilantro Lime Rice if you are feeling extra fancy and because I think rice is always a good idea. 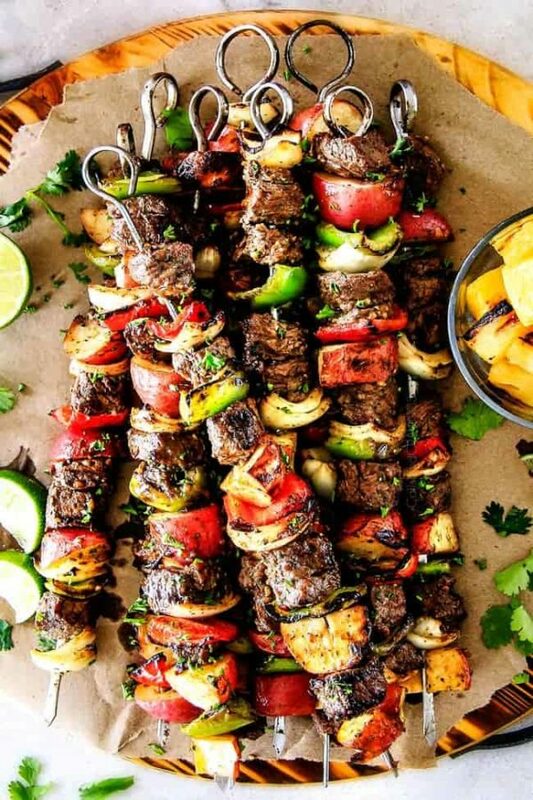 I also love that these Brazilian Steak Kabobs are completely customizable – skewer them all the same or skewer some all meat, some all veggie, or some with onion, some without, or to make it a fun hands-on meal, diners can make their own Brazilian Steak Kabobs with more or less of whatever they desire. This approach also cuts down on the skewering time for you! Aside from the actually skewering, these Brazilian Steak Kabobs are super quick to throw together. 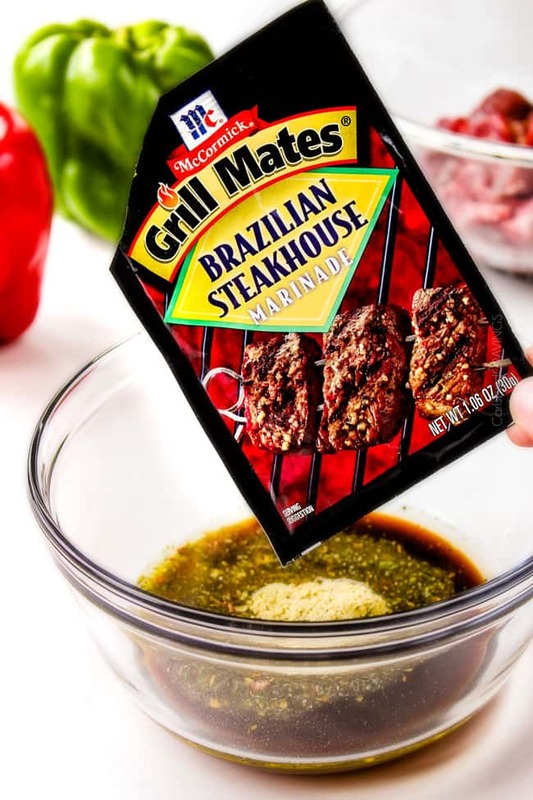 You begin by whisking together all your marinade ingredient consisting of olive oil, soy sauce, Worcestershire sauce, lime juice, and the secret to all that flavor – one package McCormick® Grill Mates® Brazilian Steakhouse Marinade. This Marinade package is everything. It’s a South American inspired blend of cilantro, garlic, onion, thyme and red and black peppers. You reserve 1/4 cup for your veggies and basting and bathe your beef in the remaining marinade for 4-6 hours. Next, we make grilling potatoes not only possible but perfect with a little shortcut. Microwave your chopped potatoes for 4-5 minutes, just until tender. This allows them to grill alongside your steak and everything to be cooked through at the same time. The only real trick is to not overcook your potatoes in the microwave or they will fall off the skewers. 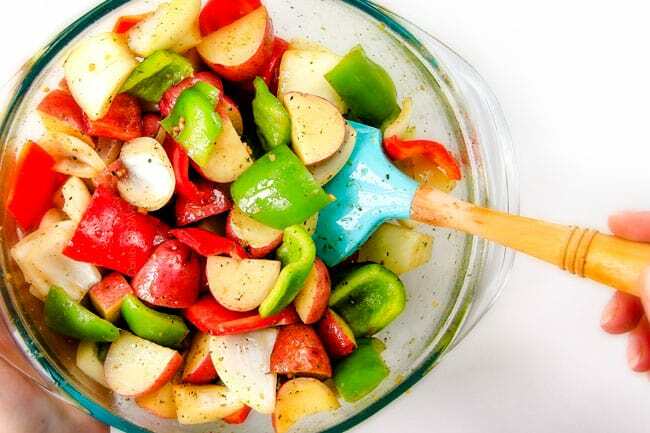 Once cooked and drained, add your peppers, onions, some of the Reserved Marinade, olive oil, salt and pepper to your potatoes and refrigerate until you’re ready to grill – so not only will your steak be infused with flavor, but your veggies as well for the best Brazilian Steak Kabobs ever. Finally, skewer your steak and veggies, being sure to keep a little space between them so that the food grills versus steams, and grill until lightly charred all over, then prepare yourself for an epic explosion of yum. If you love grilling, you will also love my Brazilian Mango Chimichurri Steak, Greek Beef Kabobs, Carne Asada, Cajun Steak, Greek Chicken, Thai Pineapple Chicken Satay, Caramelized Pineapple, Corn on the Cob, Cilantro Lime Chicken, Hawaiian Chicken Kabobs, Pineapple Salsa and many more! 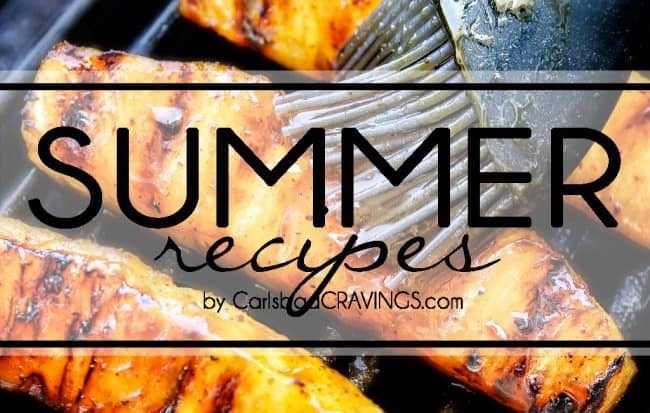 See all Grilling recipes HERE. 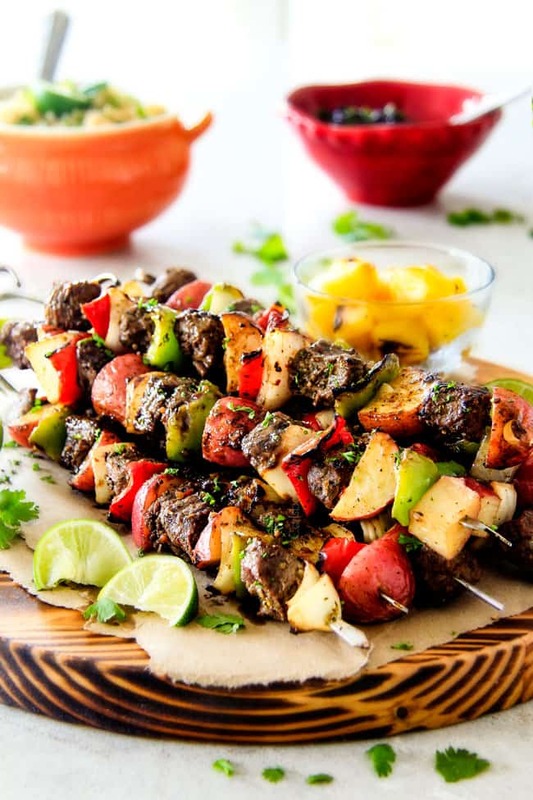 Want to try these Brazilian Steak Kabobs with Potatoes? Pin them to your GRILL, STEAK, SUMMER or DINNER Board to SAVE for later! 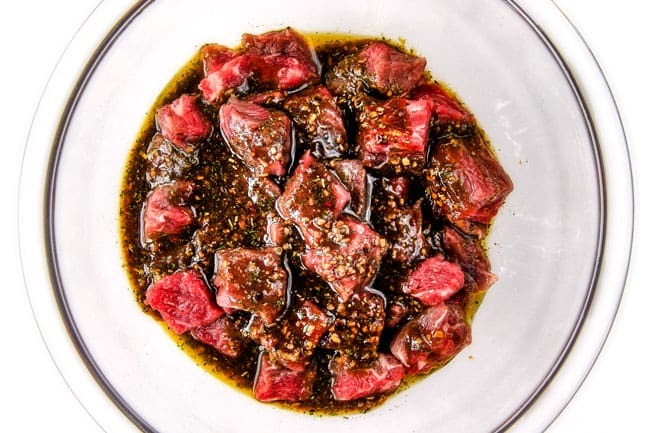 Whisk all of the marinade ingredients together in a large bowl or large freezer bag (whatever dish you are going to use to marinate your beef). Remove 1/4 cup (to use later for vegetables and basting). Add beef to remaining marinade and turn to coat. Marinate 4-6 hours in the refrigerator. Add potatoes to a large microwave safe bowl. Add 2 tablespoons water. Microwave, covered, 4-5 minutes or just until fork tender; drain. Add peppers, onions, 2 tablespoons of Reserved Marinade, 2 tablespoons olive oil, 1/2 teaspoon salt, 1/4 pepper. Toss until evenly coated. Refrigerate. NOTE: Soak wooden skewers for at least 30 minutes in water before grilling or broiling. When ready to cook, thread beef and veggies onto skewers. Grease and preheat grill to medium high heat. Grill skewers until lightly charred all over, approximately 2-3 minutes per side, basting with remaining marinade halfway through cooking. You can check a beef cube for doneness if desired. Let rest 5 minutes before serving. Delicious served with Caramelized Grilled Pineapple and Cilantro Lime Rice (links below). Preheat oven to 450 degrees F. Line a rimmed baking sheet with foil for easy clean up. Lightly spray with nonstick cooking spray. Evenly space kabobs on baking sheet and bake 12-16 minutes, turning once OR until beef reaches desired doneness (cooking time will vary depending on steak size, so you can check a beef cube for doneness if desired). I have been looking for a beef kabob recipe for a while, and I think this will be the perfect one. My husband tried Brazilian steaks while traveling there, and he loved them. so I am sure he will love these. You are so welcome, I am excited for you to try them! I think you both will love them! Hi, I live in NZ and we don’t have the Brazilian Steak Marinade – any suggestions for an alternative? Hi Terisa! Unfortunately I’d have to do a lot of experimenting in order to give you any suggestions as it is such a unique, compact flavor combo. Sorry! I couldn’t find it either, so I substituted with the Chipotle Pepper Marinade and it was delicious! I’m actually using it again today. This is perfect 4th of July food; I’m actually in the middle of planning our cookout and this is exactly the type of recipe I was looking for. Thanks, Jen! Awesome Britt, these will be perfect for your cookout and so fun! Happy early 4th! I don’t have a grill but I LUV kabobs! Could you please advise how to make these in the oven or on the stovetop? Would greatly appreciate any suggetions, THANKS! I really like your ideas. Why can’t you have a print option on your website? I like to compile my recipes in a book. HI Roberta, there are 2 print buttons – one just below the main title and one by the actual recipe – just to the top right of the title. Awesome Nikki! I love that you made these already and thrilled they were such a hit, even cold 🙂 Thank you for your kind words too – so happy you are enjoying my recipes! I made them tonight. Oh my goodness. Were they delicious!!! My 12 yr old son who does not eat steak ate the whole thing! Jen I anxiously look in my mail to see if you have posted another recipe because honestly everything I have made from your site turns out delicious. This is my favorite recipe site. Oh Carla, what an awesome comment, thanks for making my day! 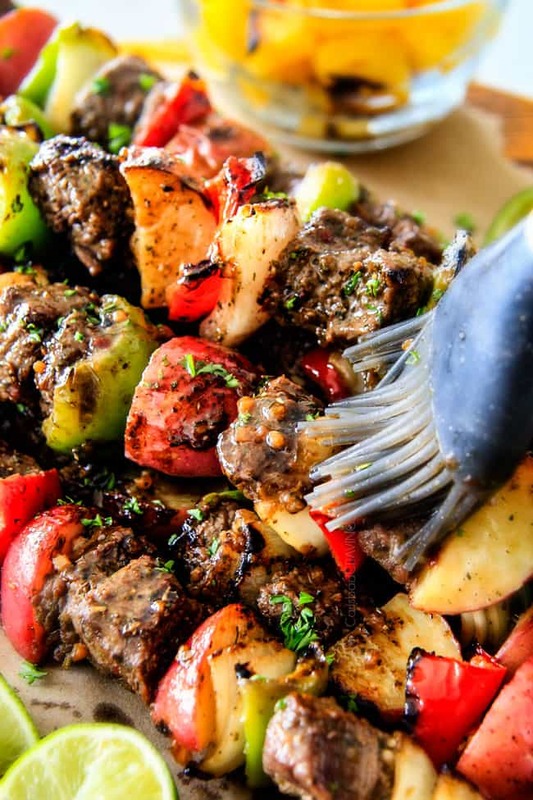 That is awesome that even your non-steak eater enjoyed these steak kabobs! I am so flattered and humbled to hear you look forward to my new recipes and that this is your favorite recipe site – I am actually typing this from my hospital bed and this comment was just what I needed. Thank you so much and God bless you and yours as well! I agree with this everything I have made has been a hit in my house!!!! Thank you so much! That makes me SO happy!! Thanks Jen ! I can’t wait to eat this ! Just marinaded :). Easy to do and it’s look so delicious !!!!!!! Yammy 🙂 . I don’t know if I can wait till 4 the of July . Awesome, Svetlana, I hope you love them as much as us! This looks delicious. Can I use an electric George Foreman grill and get the same results? Hi Jan, I don’t have experience with a George Foreman grill but I imagine it should work well! Haven’t made kabobs for a while-going to the store get the ingredients this afternoon! Your recipes are always my favorite go-to things to make and this one looks really good! Sorry Mary! You can order it online on Amazon. Soooooo delicious 🙂 I made this with zucchini, red, green and yellow peppers, too. I would have never tried the Brazilian sauce before reading your recipe, but now it will be a staple for kabobs. Thanks so much. You are so welcome Melinda! I’m so happy you tried the Brazilian marinade and now its a new staple! Have you tried this as a sheet pan meal, meaning without skewering? I would assume it would bake the same, but curious to know if you’ve tried it. Hi Jana, I haven’t tried the sheet pan method but that is a great idea! The steak might take les time this way, so I’d check it closer to 8 minutes. Please let me know what ends up working for you! Hi Jen! Ran out of skewers but really want to make these. Do you think this will turn out fine if I put everything on a sheet pan and just flip halfway if I’m using the oven? Absolutely! The skewers just make them super easy to rotate so if you do it by hand it will have the same effect. Enjoy! HI! I just have a quick question about the time to marinade. Can I leave it in longer than 6 hours? I am hoping to put these in the fridge in the morning and have them ready to grill when I get home that night so it would be like 8-9 hours? Hi Abby, that should be okay but to be safe I would cut the steak into a little bit bigger pieces. You can even cut them into chunks and marinate then chop them into cubes when you get home. I hope that helps! Jen, we do not have the Brazilian marinade in our supermarkets. All of your recipes are so great I went ahead and ordered the 12 pack from Amazon. My confidence in your recipes was justified!!! We will have no problem using all 12 packs for these delicious kebabs. When I tell my family we’re having a “Carlsbad Cravings Surprise” for dinner they can’t get to the table fast enough! Thanks Jen.